This Thai, Burmese-influenced noodle soup dish has been dubbed “Food of the Gods” by quite a few of its fans. Khaoi soi is common in both northern Thailand and northern Laos, and literally translated, “khao soi” simply means “cut noodles”, referring to the traditional egg noodles used. There some reason to believe that the dish was historically influenced by Chinese Muslim cuisine, and the fact that the soup typically contains either chicken or beef certainly helps this claim, as Muslim tradition would have forbidden the use of pork. This wonderful, spicy dish consists of yellow egg noodles in a curried coconut milk soup with meat. It is typically topped with a number of things, including pickled cabbage, fresh red onion, a lime wedge, fried crispy egg noodles, bean sprouts, cilantro, and chili oil. The curried soup contains quite a bit of garlic, which has often been touted as a wonder food for all of its health benefits. The powerful sulfur compounds in garlic kill and inhibit an astounding assortment of bacteria, viruses, fungi, mold, parasites and worms, frequently on contact. Garlic has been proven to ease respiratory diseases, inhibit some cancers, and strengthen the immune system. Though much more research is needed, it’s even been observed to help treat HIV! The chillies also used in the soup are a rich source of vitamin C and are strong antioxidants. The coconut milk that forms the base of this dish helps to maintain blood sugar, prevent anemia, control weight, lower high blood pressure, and, like garlic, aids in maintaining a healthy immune system. 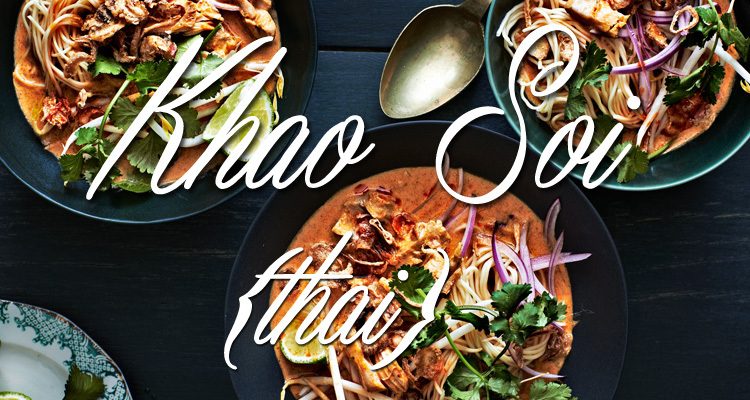 An important herb in khao soi is cilantro (also called coriander), which is a powerful antioxidant and an excellent source of a number of minerals such as potassium and iron. Cilantro is also rich in many essential vitamins, with the leaves providing 30% of daily recommended levels of vitamin C. Cilantro boosts a long lists of health benefits, but for a significant portion of people around the world it also has one major drawback. About 21% of East Asians, 17% of Europeans, and 14% of Africans despise the taste, including the illustrious chef Julia Child. To these people, cilantro tastes “dead” and like soap, and this odd fact has now been linked to genetic variants. Cilantro is much more common in South Asian, Latin American, and Middle Eastern cuisine, and the population reflects it, with only 3-7% disliking the herb. Traditionally, the dough for the egg noodles is spread out on a cloth stretched over boiling water, then rolled and cut with scissors. The noodle soup is popular as a street food in both Thailand and Laos, and in some Lao markets in Luang Namtha and Muang Sing you can still see the vendors cutting the noodles. Place chillies in a small heatproof bowl, add boiling water to cover, and let soak until softened, 25-30 minutes. Drain chillies, reserving soaking liquid. Purée chillies, shallots, garlic, ginger, cilantro stems, coriander, turmeric, curry powder, and 2 tablespoons soaking liquid in a food processor, adding more soaking liquid by tablespoonful, if needed, until smooth. Any chili should be an adequate substitute if these are difficult to find. You can customize the type and amount to your own preference for spiciness. If using fresh chillies, skip the soaking process and use water in place of the soaking liquid. Egg noodles, fish sauce, and chili oil should be available at any well-stocked supermarket, but are guaranteed in a good Asian supermarket.